Manic is the only word to describe my day so far. Overslept; then had to start the day first thing with a work-related phone interview, before I even had coffee (at least I was the one who was asking the questions); then nearly forgot I had scheduled another phone interview after that, so I was finishing up my breakfast and realized, hmm, I really should check if I have that phone interview this afternoon, OH NOES I HAVE TO CALL THE PERSON RIGHT NOW. On the other hand, I'm getting well practiced at holding the phone to my ear with my shoulder while I frantically type. (I really should get in the habit of using the speaker phone...) Honestly, it beats having to record and then transcribe the interview, which takes ages. 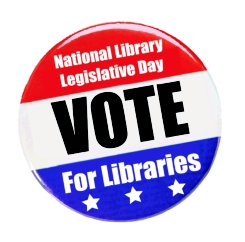 May 7 and 8 are National Library Legislative Day (NLLD) for librarians, and YALSA is inviting bloggers to participate, too: "During the month of April, we invite bloggers who care about library services to teens to devote a post to NLLD, why teens need libraries, the importance of advocacy for libraries, and why librarians matter in the lives of today’s teens." For more info, and to get your name on the roster, click here. In just a few weeks, L.A.-area folks can attend the Los Angeles Times Festival of Books! It's as star-studded as you expect an LA event to be, but it's also inexpensive and fun. I've never been, but I just might try to go this year...since I'll be in the area that weekend visiting my mom. YA author and friend of this blog Elizabeth Wein gave a talk at the Federation of Children's Book Groups conference, and shared her tips for bringing history to life--the talk is posted on the FCBG website (hat tip to Zoe @ Playing by the Book). It's National Poetry Month, and you can meet the inaugural class of National Student Poets on the Scholastic Art & Writing Awards website--five teenagers who will inspire you in their dedication to serving as ambassadors for poetry in diverse communities around the country. Read more about the award winners here. Happy Monday! I hope yours is less bonkers than mine.